Optimized for startups that want to move fast … and far. A single place for your team’s tasks, learning routines and mentoring. See Pitchworthy’s Platform for Startups in action. 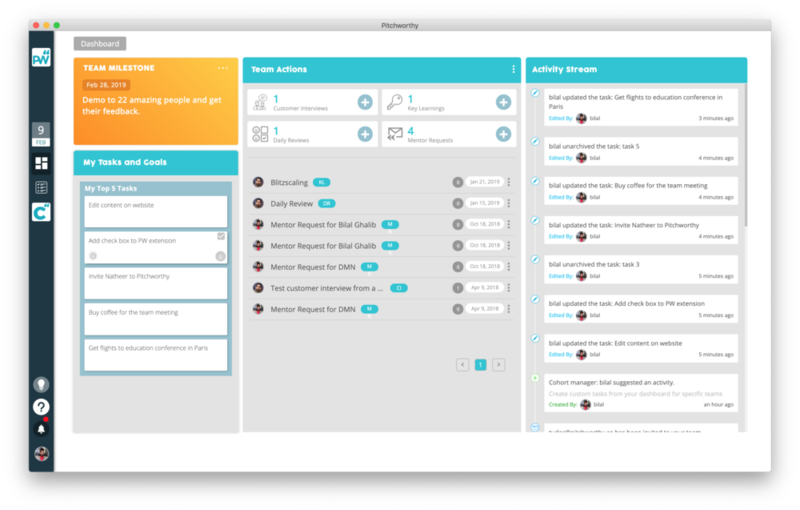 Pitchworthy can help your startup, organization, or project team move smarter and faster towards achieving your objectives. The different Pitchworthy elements go together like peanut butter and jelly. You can use only some of them … but why would you?! 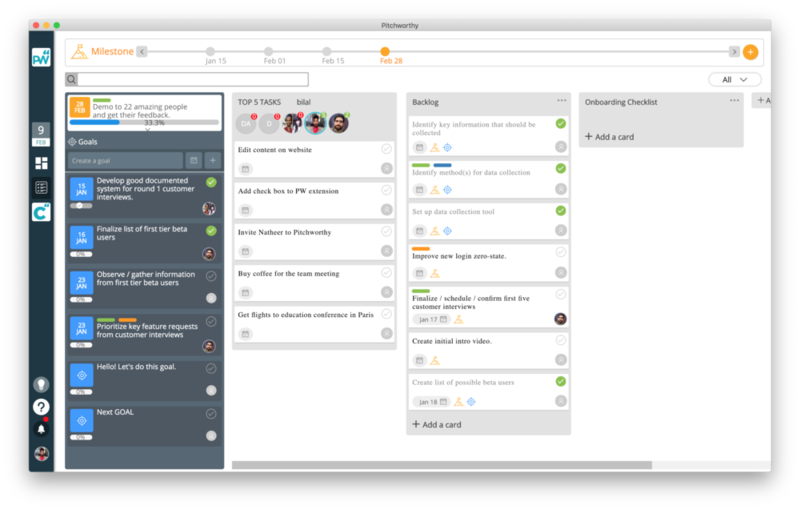 Plan ahead using team milestones, goals for each team member, and task-lists built on productivity best practices from leading global tech companies. Check out the Team Board in action in our Intro Videos. A single place to see your team results and enhance performance. See how much you have achieved, review the work history, and get critical work done in line with best practices from leading global tech companies. Check out the Team Dashboad in action in our Intro Videos. Bring your continuous learning to help your daily tasks. Collect customer interviews, knowledge resources, and team reviews under one library. Check out the Team Actions in our Intro Videos. Invite as many mentors as you wish, schedule mentor meetings or request asynchronous message-based feedback, and review your history of mentor conversations. And more valuable features to help you get the right work done. Meet likeminded teams and entrepreneurs who share a similar journey, and both give and receive feedback. Many teams are already benefiting from the Pitchworthy platform, though still in beta development. You can also subscribe today for free to get access to a great tool, while sharing feedback to help shape the development of the platform. — First-time founder; already won a startup competition.